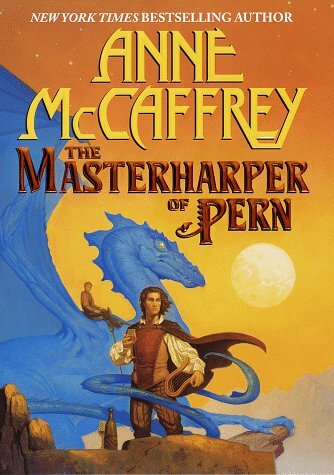 Tehani and Marisol bonded over Pern (and Doctor Who) at a science fiction convention, decided that it was time for a reread of the series, and really, they should blog about that. They are reading in Anne McCaffrey’s preferred way, which is basically publication order. M: *rubs hands together* I’ve been looking forward to this one since we decided to do this readthrough. And going through all the other books has only heightened my anticipation. Robinton is one of the longest running Pern characters, and this fills in an incredible number of gaps about his history. Not only that, but this is the only book in the series which concentrates around one person’s story. There’s very little headhopping, no scenes with Robinton not present, and the book shines because of it. This is the meatiest book in the series, and it’s a read of pure satisfaction. Even if his personal life was filled with tragedy. T: I remember when I bought this book! It was on my only international trip ever, and I read it on a plane and it was (and remains) one of my very favourites in the series (partly because of sense-memory, probably!). And my gosh, it’s hard to believe it’s nearly 20 years old! M: Petiron was a huge surprise in this book. In the Harper Hall trilogy, he comes off as someone who really loves Menolly, and this sort of old man who, despite being a type A stickler, is all right. Now we find out that Petiron, who is Robinton’s father, is a great musician, and a terrible human being. He’s incredibly selfish, and everything in his life revolves around him. I know there’s a huge push for us to see how badly he treats Rob as a baby – doesn’t care about him, pushes him away and ignores him, sees him as competition for his wife’s attention – but I think what really drives home the point is how he treats his wife. She’s his favorite, most precious toy. Virtually all of his decisions revolves around how he can dress her up and show off his prized possession. Getting denied results in sulks and tantrums. About the only redeeming quality to him personally is he will fuss over her if she’s sick. but even then, it’s like his toy has to be brought back to pretty. T: I found this FASCINATING. Did her death really change him so much? Did he regret his behaviour towards Robinton his whole life, and try to redeem himself in Menolly? Although even then, really, he didn’t actually come into the “modern” world, because he never told the Masterharper that Menolly was a girl. So he changed a bit, but not heaps? M: The flipside of this is getting to watch the Masterharper grow from childhood prodigy. I’d never really thought about that, but looking back again at things said in other books, it’s clear part of his deep connection with Menolly stems from almost identical pasts – neglect is still abuse, and being a sensitive, prodigal child leaves its own mark in any situation. T: And he’s so very gifted, which makes it even more sad that Petiron only saw him as a rival for his mother Merelan’s attention. Not even jealousy of his talent (although Merelan clearly did worry that would also be an issue) but literally that Robinton competed for her time. M: It also clears up why Sebell got picked as Masterharper rather than Menolly, which rather piqued me in previous books. T: It never bothered me, actually, because Sebell was always presented as older and more, hmm, well-rounded, I guess, in the Harper craft. Menolly has insane talent, but without the full grounding the entire Harper world. But yes, nice to have some explicit explanation of why. M: Biggest surprise still for me was seeing how much Robinton spoke with dragons. I’d gotten the impression he’d not had many spoken interactions with them in previous books, and re-reading this made me wonder if that was a misunderstanding on my part, inconsistency, or a deliberate misconstrue. T: It’s really interesting when a person who you know as an older character, with a lot of responsibility from the first moment we meet him, is revealed to us from childhood. It would be a great exercise to have a new reader START with the Masterharper book and read in internal chronology, to see their different responses to characters. M: And speaking of inconsistency – what the heck was with the big change in the Charter and handling upstart Holders? Reading Dragonseye back to back with this made me feel like I’d lost something. The Charter clearly makes provisions for Holders committing atrocities. Wouldn’t there have been enough between the escapees and not allowing people to learn the Charter? I thought the last book laid out clearly that’s a violation of the people’s rights? Gah! And it wouldn’t be a Pern book without sobbing – I was beside myself when Robinton walked the tables as a journeyman (even just glancing at the page again now brought tears prickling!). Really chuffed with the very first review we’ve seen of In Your Face, in which Robbie Coburn in Aurealis #91 says: The genre of speculative fiction can often discourage readers of what is deemed so-called ‘serious’ literature; this collection defies that idea entirely, presenting works that are as literary as they are speculative. In Your Face is a truly rewarding and affecting experience that challenges the essence of what it means to be human, now and in the future. You can read the full review in Aurealis #91. Mieneke at A Fantastical Librarian not only reviewed The Rebirth of Rapunzel, she also interviewed Kate! Check out the review and interview at the site. Thanks as always to the wonderful folks who take the time to review our work, and interact with us online! And on episode #142 of Galactic Suburbia, Alex says some very nice things about the book (after announcing the winners of the giveaway) – take a listen! We’re chuffed to see reviews already rolling through for Kate Forsyth’s non-fiction collection The Rebirth of Rapunzel: A Mythical Biography of the Maiden in the Tower. First cab off the rank, Ashleigh Meikle says the book is: a well-written, intelligent collection of non-fiction writing exploring the evolution of the tale of Rapunzel … Kate’s distinctive writing style shines through, making reading this offering as enjoyable as her novels, and is an engaging read for anyone interested in the subject matter. A brief one at The Quirky Library, in which the reader notes: It was a very enlightening piece that helped me understand the themes of the Rapunzel tale and why it has continued to play a large part in our fairytale history, its feminist retellings and also Forsyth’s research process. Alexandra Pierce gave us an in-depth reading of the book, saying (among other things): Forsyth has made her research very readable … This isn’t academic-lite; it’s academic-approachable. Cait Coker at The Future Fire decrees the book: a fascinating and readable collection, and if the material at times overlaps and repeats, the originality of the vast remainder is utterly absorbing. 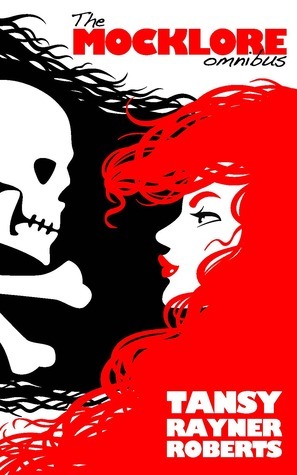 I highly recommend it for anyone interested in fairy tales, genre, or honestly, just writing. At Goodreads, reader Liesa shared a wonderful review of the book, calling it “utterly compelling”. You can get your own copy of The Rebirth of Rapunzel from the FableCroft shop page, your preferred retailer, or via Amazon. Thank you to everyone who takes the time to review our books! 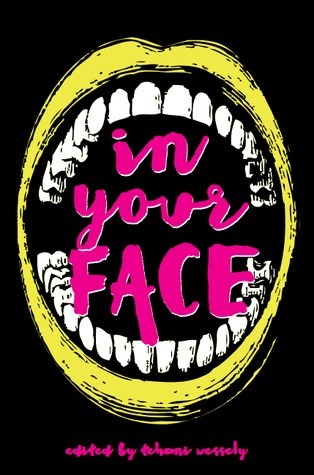 Check out the cover for In Your Face, designed by the ever-amazing Amanda Rainey! It’s a little different to the version we first shared with our Pozible backers a while ago, but we think this suits the book perfectly. We’re in the final throes of editing for the book, and on the downward track to publication – can’t wait to share this anthology with our readers! Tehani is very chuffed to have been invited as a guest to the SA Writers Centre Spec Fic and Fantasy Festival taking place on Saturday 7 and Sunday 8 May, 2016. The guest line up is amazing, with Gillian Rubenstein (Lian Hearn), Sean Williams, DM Cornish, Lisa Hannett, Jason Fischer, Ben Chandler, Tony Shillitoe and Jo Spurrier all taking part. It’s going to be a fabulous weekend – hope to see some of you there! Understanding the inner workings of small presses and publications, how they run and what they are looking for can give you “the edge” when it comes to submitting your work for publication. In this workshop, publisher and experienced writing awards judge, Tehani Wessely will share with you ways to prepare your work for submission and how you can vastly improve your chances of success. It’s been a very busy few weeks in the FableCroft household! In addition to two fabulous awards ceremonies on the weekend, we also launched Kate Forsyth’s beautiful non-fiction collection The Rebirth of Rapunzel: A Mythic Biography of the Maiden in the Tower. The launch was a great success, with over sixty guests in attendance enjoying champagne and chocolate while chatting with Kate. We had a gorgeous giveaway pack, and sold lots of books, and it was just lovely. You have just a few days left to enter the Galactic Suburbia giveaway for The Rebirth of Rapunzel – listen to the ep here and enter to win! It’s open internationally. On the subject of Rapunzel (and winners), congratulations to our three winners of the Goodreads giveaway. Sofia Raquel Romero Erazo from Puerto Rico, Sintija Ursulska from Latvia, and Sushma Pillai from India. We hope you love the book as much as we do! But one Goodreads giveaway is never enough! We also need to celebrate the brand new Mocklore omnibus, so we’re giving two copies away to a lucky Goodreads user – enter below! And just in case you haven’t already got your hands on the books, some purchase links! The Rebirth of Rapunzel can be found in ebook on Amazon, and in print from your preferred physical or online bookseller, or in the FableCroft shop. The Mocklore Omnibus, bringing back into print for the first time in many years the novels Splashdance Silver and Liquid Gold can be found all over the place in ebook and in print from your preferred physical or online bookseller, or in the FableCroft shop. Judge Tehani Wessely would like to note that it has been her privilege to know Rowena for well over a decade, not just as a professional, but as one of the nicest and most hardworking people in the field. Rowena has been a mentor and friend to Tehani since she came on the scene in 2001/2002, and is a very welcoming figure in the community. Rowena continues to support writers throughout Australia with her generous advice and insights, as she has done for many years, through raising a large family and (more recently) despite personal tragedy. We are wiser for her presence, and happier for her company. She is a well-deserved recipient of this prestigious award. Known variously as RC Daniells, Cory Daniels, Rowena Cory, Rowena Lindquist and Rowena Cory Daniells, Rowena is perhaps best know within the science fiction community as a writer. However, many don’t realise how much she has done to support not only other writers within the community, but organisations and events as well. Rowena been involved in speculative fiction since 1976 when she and Paul Collins set up the small press publishing house Cory and Collins in Melbourne, and Rowena’s first publications included cover art for several Void publications titles. Rowena’s speculative fiction stories have appeared in magazines and anthologies both in Australia and internationally since 1997. Her first novel, The Last T’En, was published in 1999. She has subsequently published further T’En books, and several books in the King Rolen’s Kin and Outcast Chronicles series, as well as the children’s novel The Evil Overlord, teen mystery Mystery at Devon House and the crime paranormal The Price of Fame. She has supported the writing community by serving on the management committees of two national genre awards, as well as the Romance Writers of Australia, Queensland Writers Centre, the Brisbane Writers Festival and Fantastic Queensland. Rowena has worked in independent press, run a bookshop, served as a volunteer on state and national Arts Bodies, and organised national awards. She was instrumental in the establishment of the wRiters on the Rise (ROR) workshop group (with Marianne de Pierres), which has helped support the careers of authors such as Margo Lanagan Trent Jamieson, Richard Harland, Tansy Rayner Roberts, Maxine McArthur and Dirk Flinthart. Again with Marianne, Rowena was a founding member of the VISION writing group in 1996, the group that went on to form Fantastic Queensland, which subsequently ran Clarion South, and she served as a judge for the Aurealis Awards for five years, as well as judging short story competitions for different organisations. Rowena has set up national workshops and pitching opportunities and run workshops on writing at national SF conventions, schools and libraries and World Con 1999. Rowena has consistently supported new writers and editors in the field, offering advice and stories without hesitation. Her professional writing work has been shortlisted for many awards over the years, such as the Norma K Hemming Award, the Romance Writers of Australia Book of the Year, and the Ned Kelly Awards, most recently including Aurealis Awards nominations for both her short story “The Giant’s Lady” and her Chronicles of King Rolen’s Kin series for the inaugural Sara Douglass Book Series Award. Thank you, Rowena, for your (continuing) contribution to the field.